Art Brewer is a California surf photographer who is considered the best in the industry. 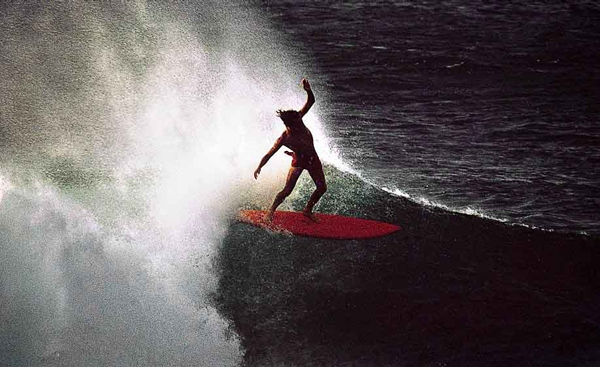 His color infused images and unique compositions have created surfing’s most memorable images. Art was kind enough to spend some time to speak with us. Tell us about growing up in Southern California. I grew up in Laguna Beach. I was lucky enough to be born and raised there. When I was old enough to no longer need a babysitter, my parents would drop me off at the beach and basically the lifeguards became the babysitters. I would learn about surfing and swimming and fishing. Where else could you do all of that? I spent most of my time at Dana Point, Doheny and San Onofre learning to surf. The ocean has taught me a lot from being so close to the people who lived there—from the artists to the fishermen. It was like an education through osmosis in a sense; it just kind of seeps into you. I think the ocean… it tends to keep you out of trouble. And it was always there to constantly entertain. My first board was an 8’6” Hobie, clear with a one inch balsa stringer and basically a standard board – a little hippy in the back. It was just a super clean board. I talked my dad into buying it for me when I was working for him. It was a $106 in 1963. How would you describe the feeling you felt when you first stood up on a board? It was such an incredible sensation. Just the whole movement in the water — riding a wave. It just puts you in a place that just takes you away from everything. Your problems go away. It’s exhilarating. Even today, I can go out and bodysurf or on an air mattress and I still get that same feeling. Of course, surfing is a little different because you are up above the water as it increases your perspective. Would you like to talk more about surfing or photography? Well they kind of go hand-in-hand. I love surfing as much as I love photography. They’re two things in my life that everything revolves around. Something that will really stand the test of time. You can get away with so much with video because it’s moving. With video, you tend to miss all the little flaws and mistakes. In a still photograph, the image has to be concise and perfect because it’s frozen in time. Everything is there for you to look at and pick apart. When you look through your lens what do you look for first? Generally for focus! (Laughs) Of course, you can shoot things out of focus for effect, but if things aren’t sharp, especially in action, you can’t see what you are shooting. If you are not in focus, something gets lost in the experience. You always want to get some detail to make it as real as possible to the person looking at it. Light and motion. People. The friends you have and make as you grow up. There are certain people, I really admire … their style. It transfers over into the way they live. They surf a certain way and it’s translated into the way they live and how they create on a daily basis. John Kelly, an artist and one of the original big wave surfers, was amazing—his love for the water and his dedication to it. And then there is Lopez. Gerry is another guy that has that same type of energy that translates from the water to land. As far as photography, there are a lot of different influences. I was fortunate enough to take a workshop and to be an assistant to Ansel Adams back in 1973. I was familiar with Adams and Weston, but he introduced us to Wynn Bullock, Judy Dater, Jack Wellpot, Jerry Eullsman, Miner White … that whole other group of people. I was seeded with that traditional classic type of photography that those people were producing. I am also inspired by people like Terry Richardson, Albert Watson, Richard Avedon, and Irving Penn. Surfing photography is one thing and traditional photography is another. But it’s really something when you are able to blend both of them together. It comes out just a little bit different, a bit more inspirational. Today, photography has become quite homogenized. It’s become a lot of pretty pictures or eye candy. I always had this philosophy that I never wanted to end up being the guy that shoots the postcards. My daughter. She teaches art and photography at San Clemente High School. It’s neat to see her do this. She doesn’t follow my footsteps at all. She cuts her own trail. It was something I never saw coming. Trying to be as real as possible, to try to stay centered and somewhat humble about whatever you do. It just makes it easier to fall into place and flow with people. Being on a boat and being out on the water. Doesn’t really matter where. Also traveling and seeing new things. Of all the places you’ve traveled to, what place in particular stands out and why? All of them. (Laughs) I would love to go back to explore India because I just had a slight taste of it. And there is something about the people and culture there, just the colors and the light. And I keep getting drawn back to Indonesia simply because of the consistency of the waves and that I am always finding something new when I go there. I can always go to the Mentawai Islands and go north from there, and we always end up finding something. You just lose the crowds and you find these little mysto spots that are tucked away. Who are your favorite surfers you like to go on shoots with? I recently had a trip with Herbie Fletcher, who is an old and dear friend. We were down there with his son Nathan, Matt Archbold, Bruce Irons, Danny Fuller, John John Florence, and it was a pleasure. It was like family and was really special. We went down there and had a great trip. To have been able to experience what I’ve experienced in my life, and the period of time I’ve grown up in and gotten old in. I don’t know what the future brings, but I do know that it won’t be the way that we’ve had it. It was less populated, less crowded and less laws. It was just a bit more wild. You just can’t replace that. Probably chile relleno with a Dos Equis or it would be Poki. I’m a fish person in reality. What kinds of music are listening to these days? Lately, for some reason, I had some ska on. I’m sort of a mixed bag; I like all sorts of music, from jazz to rock to classical. Seems like a lot of music today is like candy. They’re not really saying anything and it’s just a beat. What’s next for Art Brewer? The immediate future is going to New Zealand for a couple of weeks with the family – my wife and daughter. I’m taking my dive mask, wetsuit, and fins to hopefully pick a few abalone. And I am taking my air mattress with me and, if nothing else, ride a few point breaks. Find out more about Art Brewer and his photography here.